We have been talking about Hotspot 2.0 (a.k.a. Passpoint™) for several years now. What it is, why it matters, and how to prepare. This year, we predict at least one major hospitality brand will move forward with a Hotspot 2.0 deployment to deliver frictionless secure and automatic connectivity to their guests, possibly even offering this as an incentive to join their loyalty program. We’ll also continue to see the aggregation of Wi-Fi footprints via Hotspot 2.0 amongst brands and/or geographies (e.g. a hotel chain, airline, and restaurant chain or an airport, municipal network and group of hotels within a city). The expanding prevalence of HS 2.0 networks will also facilitate cellular offloading. Customers demand high-performing continuous connectivity and yet cellular coverage is often compromised indoors. In 2019 we’ll see more offloading arrangements and network sharing where voice and data will move seamlessly between cellular and Wi-Fi networks, often without the end-user even knowing. 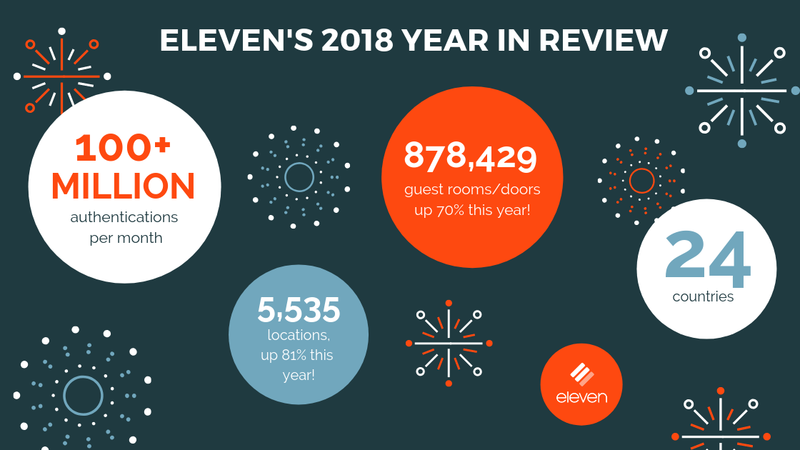 Eleven started out deploying networks in hotels and immediately saw the need for better consistency and structure when it came to guest Wi-Fi–thus the ElevenOS platform was born. Over the past few years, we have seen more and more operators and brands standardize on a network stack across multiple locations, resulting in not just business efficiencies, but ultimately, a better connected experience. We predict we’ll see more standardization of hardware and software platforms and more functionality moving to the cloud to drive consistency, transparency and better economics across their footprint. In this process, there will be strong winners and losers. Technically called 802.11ax, Wi-Fi 6 is a new type of WLAN designed to operate in the already existing 2.4 GHz and 5 GHz spectrums. The Wi-Fi Alliance® announced the simplified numbering system they'll now use to identify versions (instead of 802.11ac, etc) last year. Each generation of Wi-Fi delivers faster speeds and increased throughput. Wi-Fi 6, set to be released this year, will deliver an improved experience to address device and application needs in a range of consumer and enterprise environments. This will give way to the ability support more concurrent devices at faster speeds than ever before. Homes, offices, and hotel rooms will continue to learn more tricks.. Digital keys, smart thermostats, and intelligent flat screen TVs will become more pervasive. We will see the rise in these IoT devices in public and private settings. According to the WBA, during the last year more than 85% of companies have increased the priority level of IoT on their roadmap, and Wi-Fi will be essential for IoT connectivity, as the technology of choice for any higher bandwidth requirements. While the proliferation of IoT devices is exciting it represents a new attack vector and thus a new security threat. It’s highly possible we’ll see another major cyber breach materialize through an IoT device in 2019. Network management and monitoring in a variety of forms will be on rise. Cloud-based software will be leveraged to monitor and manage networks offsite. Increased automation will keep networks running optimally with less human and onsite intervention. As more IoT devices come online, the risk of technology failure increases. With the rise of machine learning (ML) and artificial intelligence (AI), self-healing and proactive diagnostic tools are completely possible. The introduction of 5G has caused waves of doubt in the staying power of Wi-Fi technology. We think this couldn’t be further from the truth. The demand for connectivity is showing no signs of slowing and 5G will work in conjunction with Wi-Fi to keep people seamlessly connected. If we learned anything from Hotspot 2.0, it was just how long it can take for the market to adopt new technologies. While we are keeping our eye on 5G and what it means for Wi-Fi, we predict it won’t hit hard for at least another year despite the onslaught of advertising and promotion. Being the #1 most demanded amenity for the last 5+ years, Wi-Fi has an undeniable effect on loyalty. If hotels fail to deliver a fast and consistent connection, guests will go looking for it somewhere else. It's really that simple. Wi-Fi also presents unique opportunities to get to know guests better. Not just what devices and browsers they use a but how move through your hotel and how to offer relevant and timely promotions. Wi-Fi will continue to open up doors for ancillary services such as advertising, location analytics, proximity marketing, and customer profiling. Additionally, Wi-Fi will facilitate lots of new back-of-house technology such as staff alert buttons, work requests ticketing and staff training and engagement.